With makeup by L’Oréal Paris, Aashni and her bridesmaids exuded the essence of the Spice Girls' with their fabulous fashions, style and individuality. ‘If you wanna be my lover, you gotta' get with my friends... Make it last forever, friendship never ends...’ These are arguably some of the truest lines about friendship in the hit track 'Wannabe' by the former hit UK girl band Spice Girls. 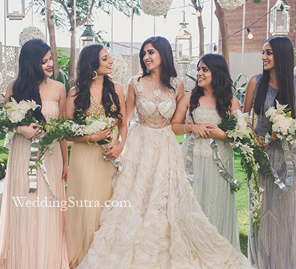 Bride-to-be Aashni Bhimani and her squad seemed to echo the same thoughts. In their photoshoot, the six girls channeled their inner Spice Girl and also spent quality time with each other before their best friend tied the knot. With L’Oréal Paris’ best-selling products such as L’Oréal Paris Color Riche Moist Matte lipsticks and L’Oréal Paris True Match Foundation, the girls got beauty makeovers that were inspired by the personalities of their favorite member of the Spice Girls. 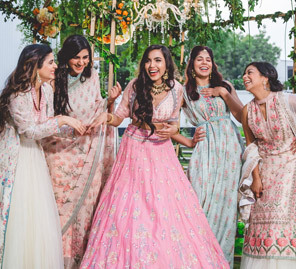 WeddingSutra Favorite Makeup Artists Nandini Advani and Neha Shah blew life into their ideas, after which Neha and hairstylist Anisha Nagpal focused their attention on taming the squad's tresses to help them portray and project their personality perfectly. The girls were dressed in gorgeous ensembles by leading designers. Karleo Fashion, Label D, Sania Shroff Label and Rebecca Dewan let the girls pick their favorite outfits from their extensive collections. Jewellery pieces by Pipa Bella were also elemental in perfecting each look. The open-air setting of one of the chicest lounges of Mumbai, AER at the Four Seasons Hotel Mumbai added a touch of effortless glam to the pictures that were deftly captured by WeddingSutra Favorite The Lightsmiths. 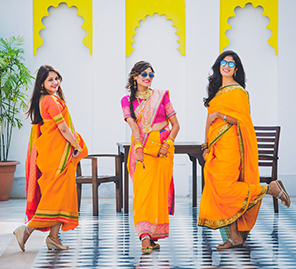 WeddingSutra did a marvelous job at making the girls feel comfortable in front of the camera, and the photography team captured one-of-a-kind frames that were in line with the theme of the shoot. For the leader of the pack, the most fitting Spice Girls inspiration was Ginger Spice. Makeup Artist Nandini Advani began by prepping Aashni's skin using the L’Oréal Paris True Match Foundation in Golden Beige. The foundation’s super blendable texture helped her create an even facial canvas. The highlight of Aashni’s look was the L’Oréal Paris Color Riche Moist Matte lipstick in Chocolate Bisous, a strong lip color fitting for the boss of the pack. Impressed by the selection, the bride-to-be said, “I loved the shade of lipstick used on me. I typically avoid brown shades. However, this color looked perfect on me." To match her avatar, she picked a Label D. champagne gold lehenga with silver details, a cape, and a bustier blouse. To finish the look, she wore earrings by Pipa Bella and was ready to strike a pose. Shop the L’Oréal Paris Color Riche Moist Matte lipstick in Chocolate Bisous here. With a heightened sense of cutesy style, Simran Jagwani fit the role of Baby Spice effortlessly. Makeup Artist Nandini Advani began by using the L’Oréal Paris Base Magique Transforming Smoothing Primer. Not only does the product minimize the prominence of pores and fine lines to transform your skin surface, but it also contains a fine powder that absorbs sebum and reduces shine. Nandini brought a touch of glow to her cheeks with a hint of the L'Oreal Paris True Match Lumi Liquid Glow Illuminator in Rose. To complete her look, she relied on the L’Oréal Paris Color Riche Moist Matte lipstick in Marsala Wine. Simran loved the shade on her lips and said, “I have been using products by L’Oréal Paris for a very long time, and I have never had a complaint. I loved the marsala color of the lipstick which amped up my look for the shoot and made a bold statement. The color was beautiful, and it lasted long and didn't dry my lips either." Simran opted for a white ruffled lehenga with a cold shoulder blouse by Label D. The solid color outfit was enhanced by golden floral embroidery on the blouse that was fringed with golden tassels. For the final finish, her hair was styled in soft curls that tied the whole look together beautifully. Shop the L’Oréal Paris Color Riche Moist Matte lipstick in Marsala Wine here. Commenting on her look, the Sporty Spice of the group said, “I was inspired by Melanie C, and my look did full justice to her style. From my makeup and hairdo to my clothes, everything was on point and something I could easily imagine on her if she were to bring on her Indian side.” L’Oréal Paris Color Riche Moist Matte lipstick in Rouge A Porter was makeup artist Neha Shah’s secret weapon to ace this look. “The deep moisturizing quality of this product gave me matte and creamy lips”, shared Vaibhavi. The L’Oréal Paris Base Magique Transforming Smoothing Primer was used to smoothen her skin while hydrating it at the same time. The L'Oreal Paris True Match Lumi Liquid Glow Illuminator on her cheeks gave her flawless highlighted cheeks with a hint of rose. The deep blue lehenga by Rebecca Dewan made for the perfect outfit for this look. “The ensemble I wore was quirky, and it was quite different from the kind of clothes I usually wear. The color stood out, and the styling was great,” said Vaibhavi. Shop the L’Oréal Paris Color Riche Moist Matte lipstick in Rouge A Porter here. Representing the bold and a tad crazy Scary Spice was Krupa Doshi. Nandini Advani decided there was no better lip color than the L’Oréal Paris Color Riche Moist Matte lipstick in Brown Sucre for this bold beauty. The rich pigment was just what she needed to evoke Mel B’s loud Spice Girl persona. “I loved the creamy chocolaty color of the L’Oréal Paris lipstick”, said Krupa. To make her makeup more pronounced, she highlighted Krupa's eyes using earthy shades from the L'Oreal Paris Color Riche Gold La Palette and built up the drama with L’Oréal Paris Volume Million Lashes Mascara. With the earthy eyes and statement lips, Krupa was ready to rock the day with her squad. Shop the L’Oréal Paris Color Riche Moist Matte lipstick in Brown Sucre here. Shagun Jain’s sophisticated style was reflective of the classy personality of Posh Spice and thus her avatar was chosen accordingly. Makeup Artist Neha Shah wanted to create a look that seemed like it was straight off the runaway, and so she focused on giving Shagun a flawless complexion and striking lips. L’Oréal Paris True Match Foundation in Golden Beige was the product she used on Shagun’s skin. The skin perfecting pigments in the foundation helped create a radiant complexion and was ideal for longer wear. “I loved the luminous glow that the L’Oréal Paris foundation gave me”, shares Shagun. To add to her chiselled look, Nandini used the L'Oreal Paris True Match Lumi Liquid Glow Illuminator in Rose to add a strobing effect on the bridge of her nose, the apple of her cheeks and the tip of her chin. She then used the L’Oréal Paris Color Riche Moist Matte lipstick in Marsala Wine for a vivid color touch. The lipstick was the focal point of her look and its formula enriched with oils ensured hydration throughout the shoot. For Shagun, it was a metallic creation by Karleo Fashion that helped her truly embody Victoria Beckham’s spirit and style. The silver high-neck gown was resplendent with a statement neckline that featured sparkling details and her sleek hair helped her further in mastering Victoria Beckham's sleek look. The Spice Girls may have had just one Baby Spice, but in Aashni’s gang, Brijal was the second Emma Bunton. Makeup Artist Neha Shah added a pop of color to her lips by using the L’Oréal Paris Color Riche Moist Matte lipstick in Raspberry Syrup. While she explored a softer palette for the rest of her face, she let her eyes be intense by using the blue and grey shades from the L'Oreal Paris Color Riche Gold La Palette and multiple coats of the L’Oréal Paris Volume Million Lashes Mascara. 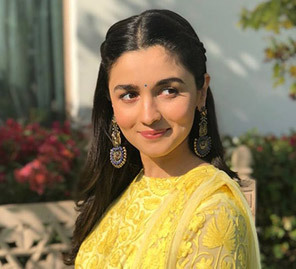 For a flawless summery look, she also added a hint of L'Oreal Paris True Match Lumi Liquid Glow Illuminator in Rose on her cheeks. Shop the L’Oréal Paris Color Riche Moist Matte lipstick in Raspberry Syrup here.